Very impressed, something more pocket sized but with all the power of the Arc.I think its realy snazzy and cool..
not only so cute, but also fast and powerfull. like me :P.
does this have a gorilla glass display - it says scratch resistant surface ? scratch resistant surface - does that mean a gorilla glass display ? Does it support Motion Gaming!..?? ...And won't playing HD Games be a problem with this HVGA 320*480 screen..?? Abhi, 25 Jun 2011Does that mean the HD games will automatically resize for this screen resolution on Xperia Min... moreYes. As I said look at the Samsung Galaxy Ace. It has the same screen resolution. It doesn't seem to be strugging anywhere does it? Opportunist, 21 Jun 2011The problem screens were the 320x240 SVGA screens which had really low capability. If you li... moreDoes that mean the HD games will automatically resize for this screen resolution on Xperia Mini Pro? I like this phone very much but I'm worried about HD gaming. AnonD-11664, 22 Jun 2011im vry vry vry exicted abt this phone. bcoz this phone is capable for video calling and also s... moreYou can do video calling in this phone when u are face to face with the caller. Gud n all aspects but SE didn't try for a battery improvement. Dreamer, 20 Jun 2011Heard like we need WVGA screen for playing HD games...Isnt it so...?The problem screens were the 320x240 SVGA screens which had really low capability. If you like you can compare to another HVGA phone like the Samsung Galaxy Ace, you'll see it's got pretty much full capability. Dreamer, 20 Jun 2011Heard like we need WVGA screen for playing HD games...Isnt it so...?Nope. HVGA is enough. The exception will be the few Tegra2 optimized games but they'll suffer on WVGA screens just as much if not more so. HVGA is the perfect compromize, small but with all the ability of the bigger screens. is its screen size same as xperia X8 & xpreia mini? 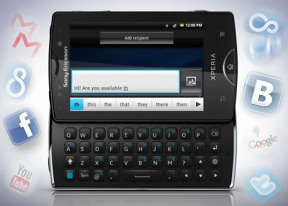 Total of 6046 user reviews and opinions for Sony Ericsson Xperia mini pro.